There are literally thousands of named cultivars of this plant in worldwide commercial use, but we could find none at all in domestic home-garden seed catalogues (Nichols carries a seed sesame that they call Benne, but that is just an old alternative generic name for sesame). That is even more of a shame than is usual with spice and herb plants, because the many cultivars have significantly different uses and advantages. Even the crude separation into "white sesame" and "black sesame" is of little assistance, because though they’re different types, the color results from how they have been processed. Moreover, since Sesame wants a long, warm growing season (it cannot tolerate frost), a fast-growing variety—like "90 Day" (a University of California release)—would be nice in our region: but, again, no choices. Finally, since "shattering" (cracking open of the seed capsule prior to intended harvest) is a problem with sesame as it is with many spice-seed plants, cultivars that minimize shattering are important to the commercial trade, and there have been such "no-shatter" cultivars for almost half a century now. But, again, no choices. And we suppose that things will continue in this way till home gardeners get interested enough to demand that their seedsmen identify cultivars on all their seeds and plants. Because sesame wants a long, warm season, we’re probably best off sowing it (direct where it is to grow) in mid-May or even around June 1st. The minimum soil temperature for satisfactory germination is 60° F., and higher is better—it should be treated more or less like a bean, even a lima bean. The general rule for herb and spice plants is that their soil needs are not demanding, save that the soil must be very well-drained: few herb or spice plants can stand "wet feet". The soil should not be particularly rich, most especially not for flavoring plants we grow for their seed (or fruit), common mis-advice to the contrary notwithstanding: a rich soil will lower the concentration of the "aromatic oils" that give the seed its characteristic flavor, which is the very thing we are growing them for. Plants that are slightly nutrient-stressed (which doesn’t mean starved) give better-tasting seed. Sesame fits that model, save that it is just a little pickier about its soil pH, wanting soil in the range of 5.4 to 6.7—it is intolerant of very acidic or saline soils. Good drainage, always wanted with spices and herbs, is even more important with sesame, as it is quite susceptible to harm from even short periods of waterlogging. Sow seed in moist but not soaked soil. 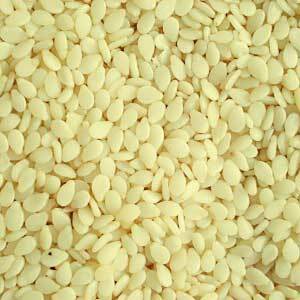 Sesame seed is quite small, so plant it fairly shallow. Ideal spacing is unclear, but 6 inches is certainly enough; significantly less is probably feasible (commercial row-crop stands are planted at 1 to 2 inches separation). As with most spices, water only lightly, so as to concentrate the essential flavoring oils in the seed. Harvest when the seed capsules have mostly or entirely turned brown, and dry well before, and then again after, threshing. Since the capsules are prone to shattering, it is probably a good idea to enclose them, as harvest approaches, in permeable "mini-sacks" of cheesecloth or the like (or perhaps old row cover bits) to catch seeds released by premature shattering. Sesame - from "Crop Plants and Exotic Plants"
It was last modified on Tuesday, 5 February 2019, at 01:33 EST.